Just looking to see if anyone is interested in a trade. I'm looking for a dual sport or a mean sport touring bike, possibly a sport bike. I'm the second owner of the truck, the first being my grandpa. The first picture is the most recent, taken on April 8 2019. 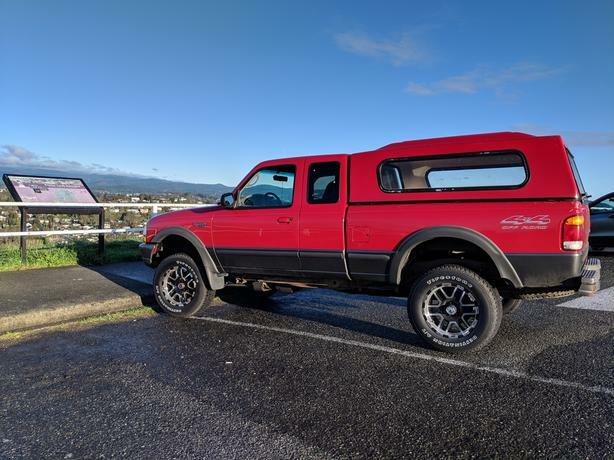 Its a 1998 Ford Ranger XLT 4x4. It has a 3" body lift and brand new rims and tires with less than 300km on them. It also has a matching canopy, which is my favourite thing about the truck. After I bought it from my grandpa, I tore the front end apart and replaced mostly everything from ball joints to control arms and then spent a bit of time doing the lift and getting rubber and rims. I have plans to add 2" spacers and add fender flares to it and pretty much turn it into a weekend camper. No oil leaks, I spent lots of time under the hood replacing seals and belts. It runs and drives great. Brakes, hubs and bearings are all in good shape as well. Make me an offer, show me what you got. I'm asking $5000 for it or a decent trade. A KLR would be awesome.